I saw the latest Bourne movie on Friday night. Following a thrilling motorcycle chase that involved spectacular stunts and ended with a horrific crash, the hero and heroine sailed off into the South China Sea on an old boat. My daughter, who really likes neat endings, expressed her frustration: “Now what?” What happens to our intrepid couple? Do they survive? Do they marry? Do they stay under the radar of the government agency trying to destroy them? We won’t know until someone produces the next Bourne movie. I’ve noticed that over the past few decades, many Christians haven’t answered this question any better than the writers of the Bourne movies. We’ve focused our attentions almost solely on the salvation of those around us to the point we conduct special services, host special events, even write special prayers for people to repeat after us, all in the hopes that others will be born again. I still remember reading about one poor soul who said he was saved 4 times while walking across the quad at his university because he repeated a sinner’s prayer with 4 different evangelism groups on his way to class. Don’t misunderstand me: I see nothing wrong with evangelism. In fact, I encourage it. However, any focus can become an obsession, so much so that we forget the rest of the picture. Salvation involves more than spiritual freedom and deliverance from eternal condemnation. Salvation involves a lifestyle that, when properly lived, brings joy to the Christian and conviction to unbelievers. The joy experienced by believers should flow out of their lives into the lives of everyone around them, convicting them of their need for salvation and drawing them to the only place they’ll find it: The cross and empty tomb of Jesus, Our Lord. Following his call for church unity around the gifts of God to the Church — those God has called to serve the saints — St. Paul shifted gears in his letter to the Ephesians. St. Paul began describing the lifestyle the Ephesian believers should demonstrate in their society. Some of the qualities we read here appear in other works of philosophy in the ancient Greek world. None of these qualities would have appeared totally foreign to the Ephesians. However, the ability to live by this lifestyle would come only by the empowerment of the Holy Spirit, whose presence in the Christian would shine through the characteristics we read in the Scripture reading and sermon text for today. St. Paul began by telling the Ephesian believers, “You must no longer walk as the Gentiles do, in the futility of their minds.” Here, St. Paul adopted the term “Gentiles” to denote unbelievers. 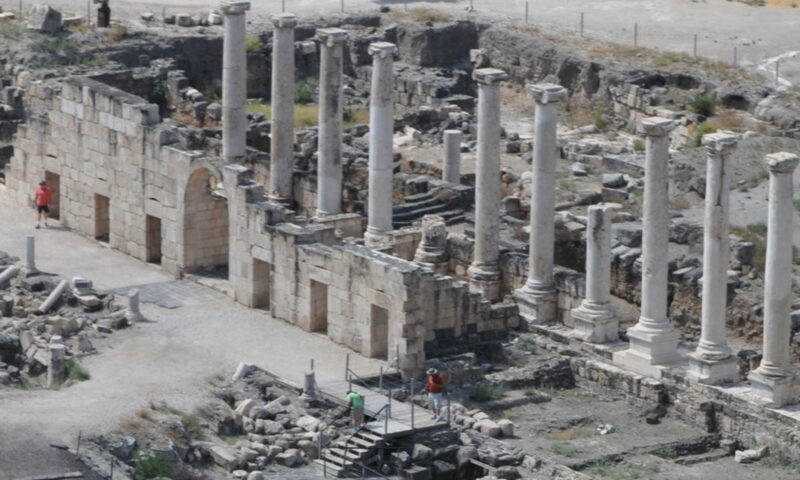 Ephesus boasted the world-famous temple of Artemis, the Greek goddess of the hunt and of fertility and childbirth. The Greeks and Romans in Ephesus would have worshiped an entire pantheon of deities, with each deity overseeing a specific area of life. According to St. Paul, “They are darkened in their understanding, alienated from the life of God because of the ignorance that is in them, due to their hardness of heart.” The pagans remained separated from God because of their ignorance, but many of them refused the truth of Christ because of their hard hearts. St. Paul continued by saying, “They have become callous and have given themselves up to sensuality, greedy to practice every kind of impurity.” Almost every ancient civilization witnessed sexual immorality of some sort. Repeated exposure to immorality both lessens the inhibitions to participate and increases the temptation to participate. Every civilization has eventually had to confront the damage caused by immorality. Never forget the lesson of history: Immorality demands a heavy price. St. Paul then reminded the Ephesians, “But that is not the way you learned Christ!” The Ephesians didn’t learn of God in immoral pagan temples; they learned of Him in the Jewish synagogues. Then, when St. Paul came to Ephesus, he first visited the city’s synagogue and preached Christ to the attendees there. After the synagogue threw out the Christians, St. Paul taught the believers in the hall of Tyrannous (Acts 19:9) for 2 years. Throughout the Roman world, Gentiles disgusted with the immorality of their pagan religions had found their way to the synagogues, drawn there by the righteous lifestyle of the Jews. St. Paul didn’t take these Gentile “God-fearers” back into immorality; he brought them farther away from it through a living relationship with a living Christ. Instead, St. Paul said, the “truth is in Jesus,” who called Himself “the way, the truth, and the life” (John 14:6). As the truth of Jesus permeated their lives, the Holy Spirit would help them “to put off your old self, which belongs to your former manner of life and is corrupt through deceitful desires.” The Ephesian Gentiles had once lived in spiritual death, but St. Paul had already written that Christ had “made alive” all who believed in Him (Ephesians 2:4-7). I believe St. Paul’s next words tell us plenty about how the Holy Spirit will transform us. He had already written to the Romans, “Do not be conformed to this world, but be transformed by the renewal of your mind, that by testing you may discern what is the will of God, what is good and acceptable and perfect” (Romans 12:2). Now, St. Paul told the Ephesians “to be renewed in the spirit of your minds, and to put on the new self, created after the likeness of God in true righteousness and holiness.” Salvation does not instantly change us; rather, the Holy Spirit begins “making new” our minds. Believers will “put away falsehood.” Because we are “members one of another,” we will “speak the truth” with one another. The truth may sometimes hurt, but it will always strengthen us and guide us into righteousness. The salvation lifestyle also helps us learn self control. “Be angry and do not sin,” St. Paul wrote; “do not let the sun go down on your anger, and give no opportunity to the devil.” Few things bring shame on a person like a bad temper. No family wants a reputation as quick-tempered. Few things “give opportunity to the devil” like a temper tantrum. Few things give proof of the Holy Spirit’s transforming power like control of our anger. St. Paul then turned to other practical issues in the Christian life. He told the thieves to “no longer steal, but rather let him labor, doing honest work with his own hands, so that he may have something to share with anyone in need.” Christians should perform “honest work” so we can help others. We should also encourage others to work for this purpose as well. According to St. Paul, we must also prevent using “corrupting talk;” the words we speak should “build up” or encourage other people. The media today constantly spread words that belittle or discourage others; some people go through their entire lives without hearing an encouraging word. We should seek to build up other people with our words; every word we speak should remind others of their true worth before God, who created them in His image. Can any of the actions we read here show Jesus’ work in us? I think of all the actions listed by St. Paul, forgiveness ranks as the action most needed in our world today. We will always face the temptation to resent those who harm us, but we must forgive them as Jesus forgave us on the cross. Jesus prayed, “Father, forgive them, for they know not what they do” (Luke 23:24). God, who is “rich in mercy” (Ephesians 2:4), has forgiven us of our sins and adopted us into His family (Romans 8:15). If our holy God can forgive us, we must forgive others. This may sound like a lot of things for us to do; this sounds like a long “to do” list for Christians. I have great news for you! Jesus told His disciples the key to keeping all these actions: “You shall love the Lord your God with all your heart and with all your soul and with all your mind. This is the great and first commandment. And a second is like it: You shall love your neighbor as yourself” (Matthew 22:27-39). When we keep these commandments, we will naturally fulfill St. Paul’s instructions to the Ephesians. To everyone who has asked the question “what now,” I have the answer: Love. Love, as Christ has loved us; love, and we will naturally speak wholesome words to one another. Love, and we will do honest work so we can provide for others. Love, and we will exercise self-control so we do not offend others. Love, and we will prepare our minds for the work of God in the world. Love sent Christ to the cross and through death to a glorious resurrection. Love will bring us through the trials of this life to the eternal joys of a new heaven and new earth, a creation in which we’ll never have to wonder what comes next. Salvation: Is God Counting Tears? Whom did God consult when Pope John Paul II died? I grew up in rural, Baptist, Fundamentalist churches of Alabama, USA, with everything that upbringing implies: dinner outside (because it was a sin to have a kitchen in the church), outhouses behind the cemetery (because it was a sin to have a restroom in the church), fervent revivals, impassioned sermons, and urgent altar calls closing every service. Every sermon was evangelistic, because every service was revivalistic. The fact that most of us were already born-again Christians in the Fundamentalist sense never dampened the ministers’ enthusiasm for winning souls. Being “born again” in these churches was not an easy task. My father, like all the pastors in the area, implored us to “come to the altar” to make things right with the Lord. The process was as elaborate as any formal confirmation service: the penitent sinner (you) would walk down the aisle (no luck trying to talk to God at your pew), ask Jesus to come into your heart to forgive you of your sins (accompanied with begging and pleading to escape the fires of hell), all to the strains of the invitation song (usually “Just As I Am”). And by the way, this was expected to be a very emotional process, replete with tears and wails; if you didn’t cry hard enough, someone might think you didn’t really mean it. Once done, you were assured you were “born again.” Everyone would come around and shake your hand on the way out the door. People measured the presence of the Spirit in the service by the presence of tears in their eyes as they stood for the closing prayer. A conversion was certain to please everyone. Over the years, I saw many people walk the aisles to be “born again” in this fashion. Many, to their credit, are still fervent, devoted believers who seek to demonstrate their salvation by their lives. However, I was always puzzled by those who did the right things, said the right words, showed enough remorse — and then fell back into their old lives as if nothing happened. The old timers would chalk it up to “backsliding” and carry on as if the person had never been to church at all. Unfortunately, I’ve always been a thinker, and I’ve often wondered what really happened when the “backsliders” prayed to Christ for salvation. Did Jesus fail them? Was there something missing on their part? This last question caused me great anguish for years regarding my own salvation. I wasn’t born again in a church; I didn’t answer an altar call. I didn’t pray the “Sinner’s Prayer.” Instead, I was dramatically drawn to Christ at my parents’ home, and all I could say to Him was, “Jesus, I’m sorry.” Was that enough? This question came back to me this week with the death of John Paul II. Immediately after the announcement of his death, those of the Church who believed John Paul II to be a born-again Christian thanked God for his leadership and expressed complete confidence that we will meet him again. The Fundamentalist camp immediately retaliated, stubbornly refusing to believe that any prominent Roman Catholic – or any Roman Catholic, actually – could be “born again.” Even worse, the Fundamentalists immediately and vociferously proclaimed their assurance that this successor to St. Peter never met St. Peter at the gates. The resulting flame wars scorched plenty of earth and electrons, but I doubt God read any e-mails before deciding the pope’s eternal fate. Now that the dust has settled, I think we should re-visit our pre-conceived notions of salvation. Our Lord could have told Nicodemus the complete, definitive, clear answer for what to do, how to stand (or kneel), and the exact words to say to insure salvation. Instead, He told him that “…God so loved the world, that he gave his only Son, that whoever believes in Him should not perish but have eternal life.” Whoever believes. How much simpler can it get? As Lewis discovered, Jesus accepts all who come, regardless of reluctance or relish, regardless of emotion or lack thereof. Jesus accepts all who come in faith. Secondly, we should remember that nowhere does Scripture teach that our spiritual birth will be consistently accompanied by dramatic emotional experiences. Many of us betray our Pietistic heritage in this regard. Yes, my spiritual birth was emotional, but I assure you my experience was far from normal. Scriptural witness does not support the necessity of an emotional experience. St. Paul simply says that “if you confess with your mouth that Jesus is Lord and believe in your heart that God raised him from the dead, you will be saved.” St. John the Apostle says that “whoever confesses that Jesus is the Son of God, God abides in him, and he in God.” Both apostles consistently speak of confession. This may be uncomfortable to those of the faith who instinctively recoil from confessions and creeds, but we cannot ignore Scripture. And this brings me to the issue of John Paul II specifically and those of the creedal confessions generally. Since I left my rural upbringing, I have met many devoted Roman Catholic, Anglican, and Orthodox believers who have fulfilled the teachings of St. Paul and St. John. These people demonstrate their spiritual vitality through their works, as St. James commands in his epistle. Furthermore, I’ve found many believers of these traditions who lack the emotional experience of the “backsliders” but possess graciousness, devotion, and spiritual endurance that doesn’t exist in many Fundamentalists I know. These people also lack the theological, soteriological arrogance to believe that everyone must be born again according to their own experience. They possess what the “backsliders” lacked: faith. When these people spoke the words at their confirmation, they took Jesus at His word that He would accept them. I’ve wondered why the question even arose about John Paul’s salvation in the first place. Why do people care so passionately about the process of someone’s salvation? Is it because they seek desperately to validate their own experience? If life has taught me anything, it’s that I cannot trust experience and emotion alone in my faith. Scripture defines our faith, and we must interpret our experiences through Scripture, not vice versa. And, like it or not, Scripture gives very few guidelines on the process of salvation other than what the Apostles recorded. God preferred to speak more about the evidence of the inward change than on the process of the change itself. When I saw John Paul II in action, I saw someone who knew the doctrines of the faith once delivered to the saints and who consistently defended them. In this week’s “Newsweek,” Kenneth L. Woodward wrote that “from his first appearance on the balcony of St. Peter’s Basilica, [John Paul II] proclaimed to a worldwide audience that ‘Christ, Christ is the answer.’” I don’t know about you, but that sounds like someone who knew Jesus. For 26 years, we saw a devoted man demonstrate commitment to the cross, even in his own suffering. We saw a man who eloquently and firmly espoused orthodox doctrine in areas of sexuality, morality, and social justice. We saw a man who inspired the youth of nations to come to Christ and the Church for eternal salvation rather than try to seek temporary gratification in the materialism of Western society. Frankly, it never occurred to me that my opinion regarding the Holy Father’s salvation mattered at all. As long as Karol Wojtyla met the standard set by Divine love reinforced with Divine humility, our standards don’t count. I think it’s time for some of us to realize that our salvation experience isn’t required of everyone. If Jesus loved us enough to die for us, He loves us enough to accept us where we are and use us as He will. He accepts all who come to Him in faith, believing He will save them. Baptist or Roman Catholic, Methodist or Anglican, independent or Orthodox; Jesus looks on the heart, not on the church sign. And He doesn’t count the tears shed in the process. All scriptures are from the English Standard Version, copyright 2001 by Crossway Bibles, a division of Good News Publishers. Scriptures quoted are John 6:37, John 3:16, Romans 10:9, and 1 John 4:15. C.S. Lewis, Surprised by Joy, quoted in The Essential C.S. Lewis, Lyle W. Dorsett, Editor. New York: Touchstone, 1988, p. 50. Kenneth L. Woodward, “Beloved and Brave,” Newsweek, April 11, 2005, Volume CXLV, No. 15. Harlan, IA.